The PH Bundle 5 by 5 lands you 4 Castles & Crusades Players Handbooks (7th Printing -- Latest Printing) (Alternate Cover) and we give you a 5th for FREE! Beyond the comforts of home lie worlds of epic adventure. With Iron Heel the World Grinds Away Plunge into worlds of fantastic adventure where dragons lie and the undead stalk the shades of your mind's imagines, where creatures of legend plunder wealth through the horror of their passage. Monsters grim and foul hold the ecstasy of gold and the renown of glory. Upon the backs of these stalk heroes of great might; those who take up sword and shield, who harness eldritch might, those who stalk the narrow corridors in search of sport and those who serve a purpose greater than all the others. Heroes. Freebooters. Mercenaries. Adventurers. A Game That is Yours to Command Castles & Crusades is a fantasy role playing game with countless possibilities. The Players Handbook allows you take up the sword and shield, the staff or bow; to arm yourself as you desires and wander upon planes of your own imagining and plunder the wealth of adventure. Designed for use with multiple players, Castles & Crusades puts you in charge of the adventure path. Included within are all the rules of play, how to get started in your very own role playing game, how to run the game and play in it. It's easy to learn attribute-based rules system allows players to choose among 13 archetypal character classes and 7 races to create their characters. 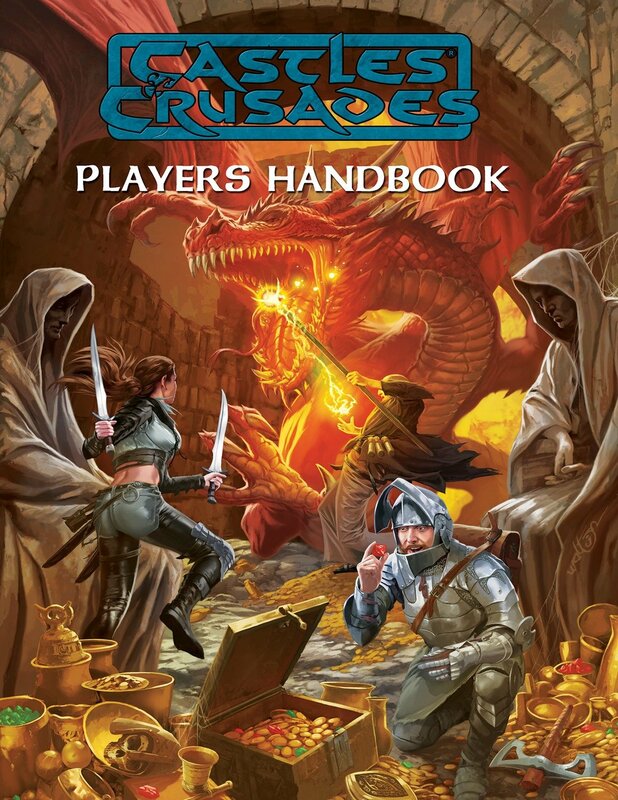 Spells, equipment, fast-paced combat rules, and all essential information needed to play a game of Castles & Crusades is in this book. Dice and Monsters & Treasure sold separately.